HERE HD Live Map (HERE HDLM), developed by HERE Technologies, is a cloud-based web service that enables you to access highly accurate, continuously updated map data. The data is composed of tiled map layers containing information such as the topology and geometry of roads and lanes, and road-level and lane-level attributes. The data is stored in a series of map catalogs that correspond to geographic regions. To access layer data for a selection of map tiles, use a hereHDLMReader object. For information on the hereHDLMReader workflow, see Access HERE HD Live Map Data. hereHDLMReader objects support reading layers from the Road Centerline Model and HD Lane Model only. The Road Centerline Model represents the topology of the road network. It is composed of links corresponding to streets and nodes corresponding to intersections and dead-ends. 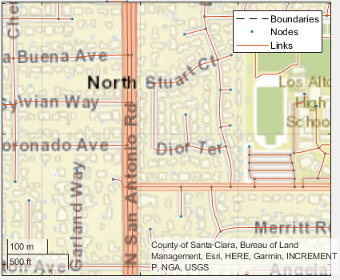 For each map tile, the layers within this model contain information about these links and nodes, such as the 2-D line geometry of the road network, speed attributes, and routing attributes. The figure shows a plot for the TopologyGeometry layer, which visualizes the 2-D line geometry of the nodes and links within a map tile. This table shows the map layers of the Road Centerline Model that a hereHDLMReader object can read. The available layers vary by geographic region, so not all layers are available for every map tile. When you call the read function on a hereHDLMReader object and specify a map layer name, the function returns the layer data as an object. For more details about these layer objects, see the read function reference page. Topology and 2-D line geometry of the road. This layer also contains definitions of the links (streets) and nodes (intersections and dead-ends) in the map tile. Road attributes related to navigation and conditions. These attributes are mapped parametrically to the 2-D polyline geometry in the topology layer. Core navigation lane attributes and conditions, such as the number of lanes in a road. These values are mapped parametrically to 2-D polylines along the road links. Speed-related road attributes, such as speed limits. These attributes are mapped to the 2-D polyline geometry of the topology layer. Precision geometry measurements such as slope, elevation, and curvature of roads. 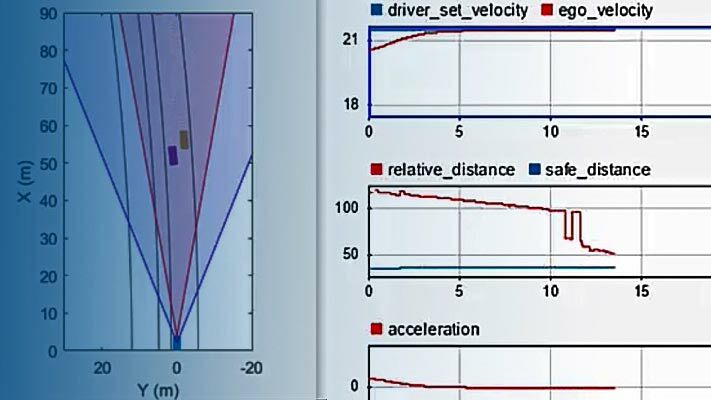 Use this data to develop advanced driver assistance systems (ADAS). References to external links, nodes, and topologies for other HERE maps. Road and lane group references and range information. Use this data to translate positions between the Road Centerline Model and the HD Lane Model. The HD Lane Model represents the topology and geometry of lane groups, which are the lanes within a link (street). In this model, the shapes of lanes are modeled with 2-D and 3-D positions and support centimeter-level accuracy. This model provides several lane attributes, including lane type, direction of travel, and lane boundary color and style. 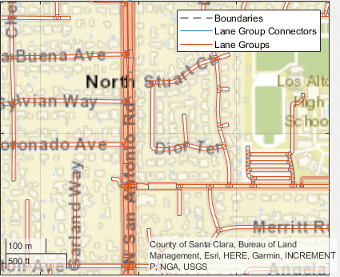 The figure shows a plot for the LaneTopology layer object, which visualizes the 2-D line geometry of lane groups and their connectors within a map tile. This table shows the map layers of the HD Lane Model that a hereHDLMReader object can read. The available layers vary by geographic region, so not all layers are available for every map tile. When you call the read function on a hereHDLMReader object and specify a map layer name, the function returns the layer data as an object. For more details about these layer objects, see the read function reference page. Topologies of the HD Lane model, including lane group, lane group connector, lane, and lane connector topologies. This layer also contains the simplified 2-D boundary geometry of the lane model for determining map tile affinity and overflow. 3-D lane geometry composed of a set of 3-D points joined into polylines. Lane-level attributes, such as direction of travel and lane type. Road and lane group references and range information. Used to translate positions between the Road Centerline Model and the HD Lane Model. The HD Localization Model contains data, such as traffic signs or other road objects, that helps autonomous vehicles accurately locate where they are within a road network. hereHDLMReader objects do not support reading layers from this model.